What makes the Peconic Bay Scallop so special? The answer’s in the mud. Baymen leaving Congdon Dock, Shelter Island on opening day of scalloping. The Peconic Bay scallop is one of Nature’s most perfect creatures. A three-inch bivalve with male and female organs, it boasts eighteen pairs of baby blue eyes, and a two-year lifespan that winds down soon after it reproduces. Then we eat it. In his 2013 memoir, chef Sanford D’Amato described his first bite of Peconic Bay scallops as “lush briny candy.” He was not the first foodie to be gobsmacked by the tiny bivalve with an adductor muscle to die for. 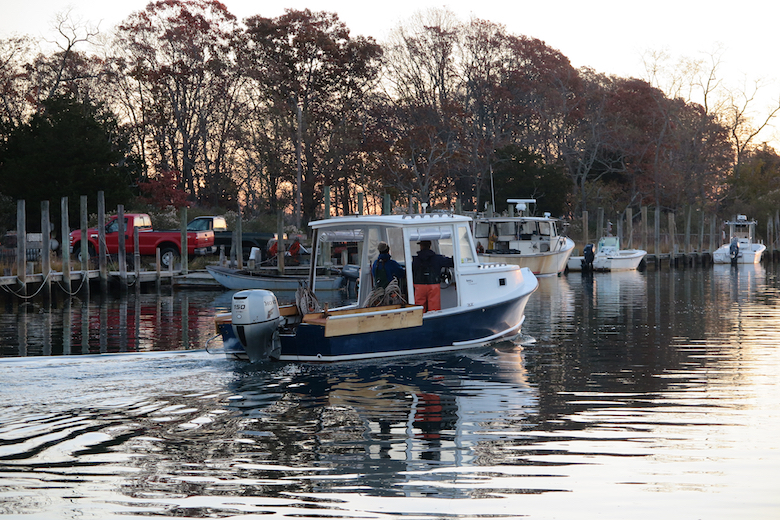 The fact that this season, which began in November and will end in March, is not as good as last year’s means people who love Peconic Bay scallops will do shocking things to get them, like pay $50 a pound retail, or venture out in open boats in frigid weather to throw dredges — heavy iron frames with a metal bag attached — into the water in hopes of harvesting enough for themselves and a few close friends. But is there really a difference in taste between bay scallops taken wild off Eastern Long Island and those from Nantucket or Martha’s Vineyard? One expert on this question is Charlie Manwaring, the owner of Southold Fish Market. He buys Peconic Bay scallops from local baymen by the bushel, then shucks them and sells them to restaurants and consumers in New York City and Long Island. “Some guys say they can tell the difference between an Orient scallop and one from elsewhere, that Orient scallops taste better,” he says. “Some say they can tell the difference in taste from scallops that are found on mud versus sand.” One of those guys, according to Manwaring, is Jim Hayward. “Everything tastes sweeter on mud,” says Hayward, referring to the effect of the mineral composition of the bay bottom on scallop flavor. The bottoms of the harbors and creeks of Peconic Bay can look like an underwater field of grass, like a sandy beach, or a mud flat, and those mineral compounds are stored in the body of the scallop. Eat a scallop that was taken on a muddy bottom, and you will actually eat a tiny bit of the mud. Jim Hayward’s Shelter Island home is equal parts restaurant, fish market, and boatyard, a reflection of how he divides his time. He came to Shelter Island from South Carolina in the 1950s to farm and fish, selling his catch out of the back of a truck. “I built this house in ‘84 and then sold fish out of the refrigerator.” Eventually he expanded to become Commander Cody’s, a restaurant with a repurposed oil drum in the parking lot emitting the blue smoke that signals the smoked scallops will be ready soon. 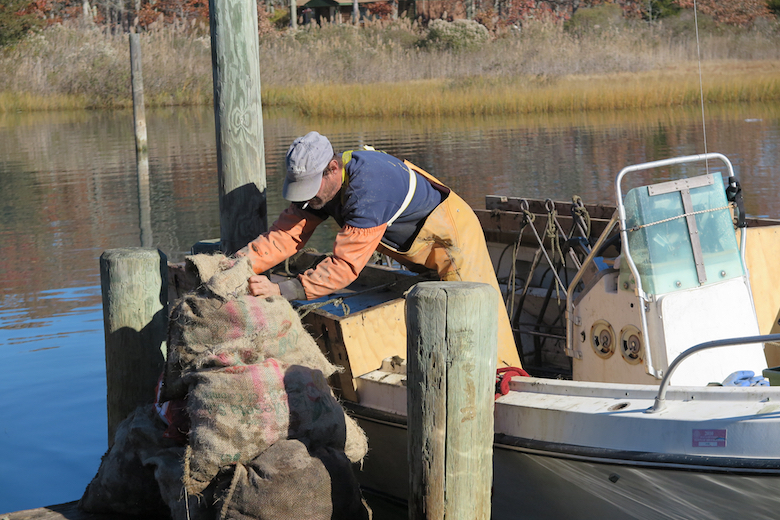 Since scallops are bottom-dwellers, harvesting them involves pulling a dredge behind a boat. The bottom of the dredge hits the scallop and pops it into the bag. This practice nearly did Hayward in one cold fall day. “I went to throw a dredge over and it pitched me right out.” Luckily, he was fishing with a buddy – except that his buddy ran the boat over him in a panic, complicating the rescue. Peconic Bay scallop, with 18 pairs of blue eyes along the rim of its shell. Hayward still goes out for bay scallops all winter, although this year he’s taking off February to go South and warm up. Cold weather fishing is uncomfortable and dangerous, but bay scallops reproduce in the warmer months and can’t be harvested until November. 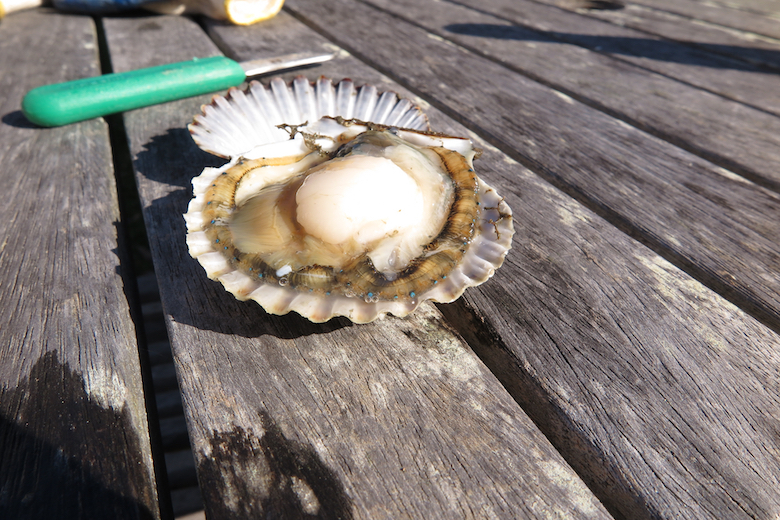 The colder and saltier the water, the sweeter the scallop. Unlike animals that store fat (an important source of flavor in meat), mollusks store energy in amino acids and in glycogen. The production of amino acids also allows scallops to tolerate salt in the brackish water of the Peconic estuary, and the water gets saltier the further east you go in the bay. Two amino acids are largely responsible for bay scallop flavor: glutamate gives scallops the savory flavor known as umami, and glycine makes them taste as sweet as estuarine gumdrops. 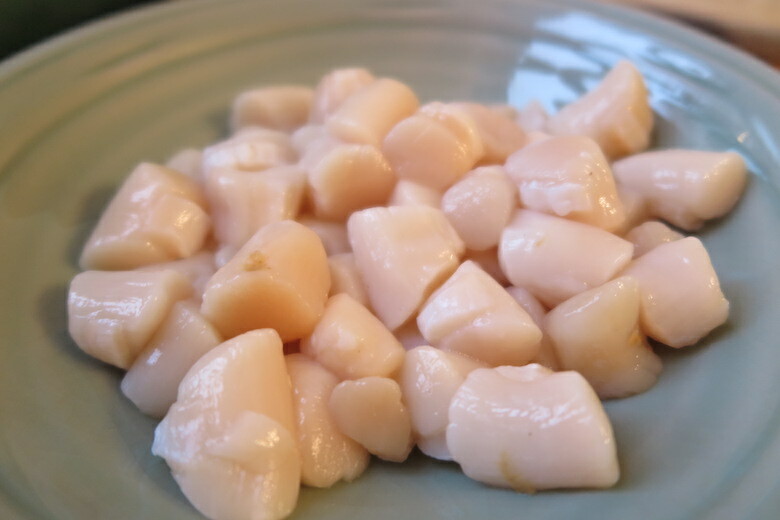 As Jim Hayward’s daughter Amanda can testify, this natural sweetness contributes to the ability of bay scallops to brown when cooked dry over high heat, creating even more complex and irresistible flavors. Amanda is a graduate of the Culinary Institute of America and does some of the cooking and all of the baking for the family’s catering and restaurant business. Equally important to scallop flavor are the microscopic animals and plants that these filter feeders feast on. The flavor compounds that contribute the “taste of the sea” to wild seafood and enhance the other flavors are bromophenols, and the kinds of plankton that create bromophenols can vary a lot from one bay or harbor to the next. 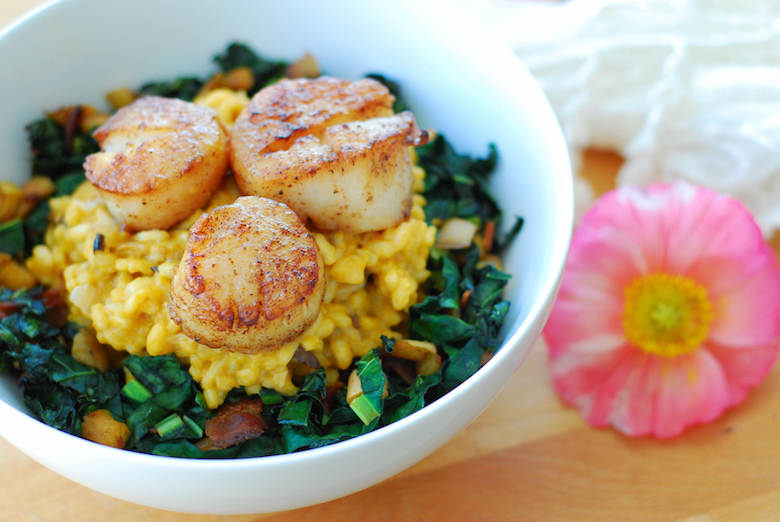 Levels of intensity of flavor depend on the species of marine organism the scallop feeds on. 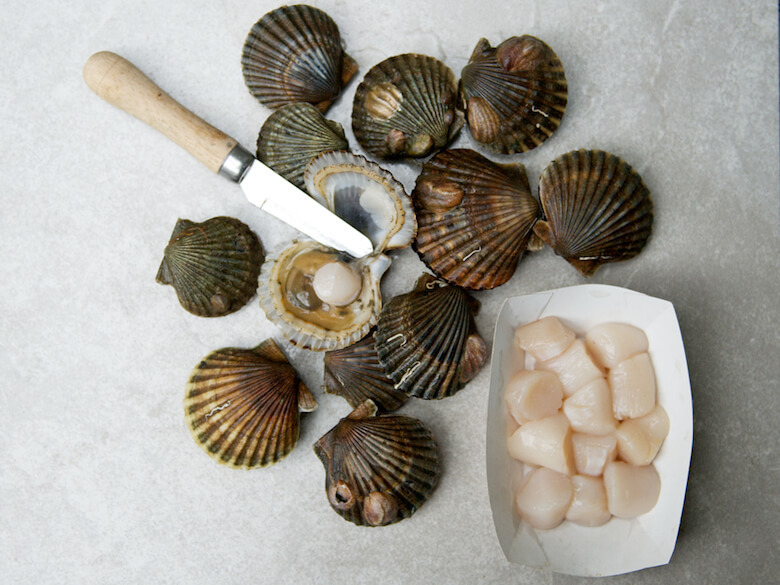 Peconic Bay scallops are plumper and more coral-colored than Nantucket or Martha’s Vineyard bay scallops. Bromophenols partly account for the fact that attempts to farm Peconic Bay scallops in China have produced scallops of the same species Argopecten irradians, but without the magical flavors. Peconic baymen always say the local scallops taste better than any other, and most of them fortify themselves during their fishing with raw scallops right out of the shell. 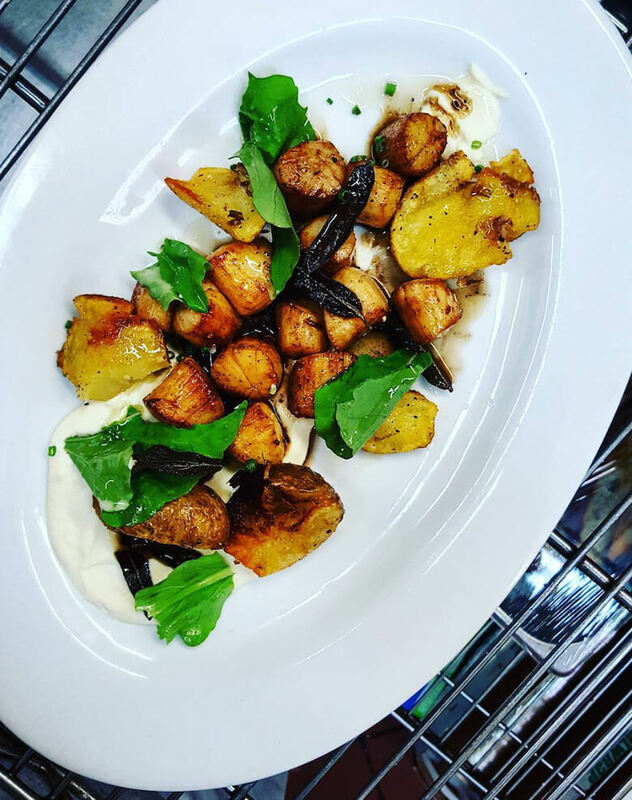 But chefs who can choose between huge diver’s sea scallops or the tiny bay scallops from Nantucket or Martha’s Vineyard go for plump, coral-colored Peconic Bay scallops when they can get them. Peconic Bay scallops make a very good first impression. Whether you are popping a freshly-opened nugget into your mouth dockside, or eating them seared on one side, barely-cooked on the other at a cloth-covered table, the first taste is the sweetness of energy-rich nutrients, an evolved flavor preference that has worked out very well for the human race. Every flavor of this perfect food reflects the bivalve’s habitat; the temperature and salinity of Peconic Bay waters, the local plankton of the estuary, and, if you are lucky, a hint of mineral mud.